This Doctoral Thesis is a deep study on almond (Amygdalus communis), intended to know the different varieties grown in Spain, to allow better use of them. 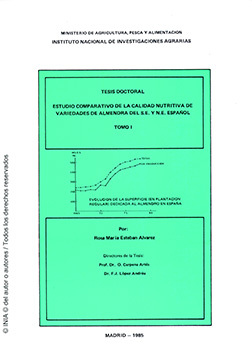 This work was focused on the study of their chemical composition: protein, lipid, carbohydrate and mineral fractions of different varieties, in order to provide objective criteria for the establishment of nutritional quality parameters that facilitate the differentiation of varieties and their appropriate use in the food industry. The book has two parts; one is continuation of the other one.